My experiments with pesto started when an aunt from Italy came home and started to make her pesto. The first thing she asked my mom was to buy some fresh basil, which 15 years ago was completely unheard of in our islands apart from its dried counterpart. So she decided to create a different kind of pesto, pounding a large bunch of Italian parsley (kinchay) along with some garlic. There were no pine nuts easily available nor did we have Parmesan cheese back then. With piping hot pasta, she tossed her green mashed concoction and called it pesto. It was one of the best things I’ve ever tasted. 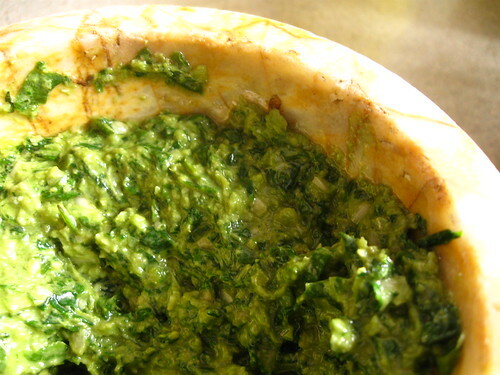 For years, I really didn’t give myself a shot in making a batch of pesto like my aunt did. But a really expensive bottle of pesto compelled me to find a cheaper and probably better alternative to the ones bought from the groceries. My first pesto recipe was simple. It merely had fresh basil (a pack is never more than 30 pesos), garlic (a bulb is around 5 pesos), and olive oil (A bottle is around 100, but this has more use than just a pesto). Pine nuts were still unavailable so I settled for these three ingredients for a good while, mashing them together with my pestle and tossing it to the hot pasta with some salt and parmesan cheese (if I’m lucky to have some). When my mom noticed the hours I slaved away for just a cup’s worth of pesto, she taught me how to use the food processor and it was merely a matter of tossing these three ingredients in the blender then a button for the whizz. For years this was what my recipe was like. Nothing really fancy about it apart from making the pesto with the freshest ingredients. Occasionally, I’d make batch of pesto base, keep it for one or two weeks and mix in other ingredients to have a change of flavor like tuna, chicken, mushroom, or even cream. The basic pesto base is as versatile as the Italian red sauce. There’s so much that you can mix it with it will have the sweetness of basil and the tartness of garlic. It’s simplicity and ease immediately made pesto as one of my favorite things to cook that whenever friends come over. You can never fail with pesto as long as you have a good pesto base. The funny thing was when I recently went to Italy and I told my aunts my pesto recipe and they immediately expressed concern on why I was missing the ever important pine nut and why I had to even think about mixing pesto with cream. Having never tasted the difference a pine nut made, my aunts showed me why pine nuts were integral to pesto. The thing that made pesto stick well to the pasta was not the olive oil but the pine nut. 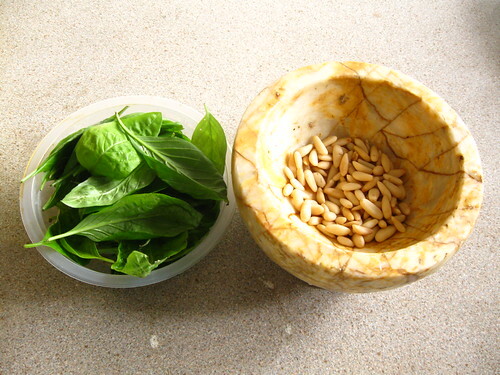 When pounded, the pine nut was like a paste that could absorb the oils and flavor of the basil making it stick to the pasta without putting too much oil in it. The result is a less oily pesto with a nice gritty texture. It was nice and creamier to the mouth. Oh well, whatever you do with your pesto, I think as long as you have a great base, you can pretty much do whatever you want. Don’t be afraid to stray from the cardinal base. Take that pesto to the next level with your own pesto experiment! 1. In a mortar and pestle/blender/food processor, mix the basil, the garlic, and some of olive oil until they make a paste. 2. Add a pinch of salt to add flavor. The salt also helps in mashing your ingredients together since it’ll provide grit as you mash it. 3. If you’re lucky, add the pine nuts here as well. 2. Add the mushroom and fry it a bit until it’s got some of the flavors of the basil. 3. Add the milk and let it simmer under low fire with the pesto. 4. Add the pack of cream and stir it in. Add some salt and let it simmer a little more, at least until the sauce is smooth and the color of the sauce is pale green. 5. Toss it with the pasta and serve it with some parmesan on top. Now wasn’t that easy peasy? Mmmmmmmmmmmmmmmm. Now this is another recipe I want to try. Any idea where we can buy pine nuts locally? But I believe Rustans sells this but a kilo I think costs between 800 to 1000 pesos. I found a recipe before that uses pili nuts as an alternative to pine nuts. Since pili is what we usually have here, I tried it. Okay naman. But I would love to try it with pine nuts. I stand corrected. It’s around 200++ pesos for 100g of pine nuts in Rustans. ;3; That’s really expensive. I love pesto=) I use cashew nuts ‘coz its hard to source pine nuts here in Davao. Love your blog. Keep it up! Thanks for visiting Jaja! :3 cashew nuts might work just as fine. As long as it has that creamy texture?